Saturday, September 1, 2018 @ 11:00 A.M.
We apologize for any inconvenience for the cancellation of this auction. Seller accepted an offer from the neighbor prior to auction. Saturday, Sept. 1, 2018 @ 9:00 A.M. Tractor, Range & Guns @ 1:00 P.M. Guns & Sporting Goods: AR-15 DPMS .556/.223 w/ Red Dot w/ 2 mags & Nc-Star 3x9x42 scope; AR-15 Diamond Back .556/.223 w/2 mags & Sight Mark Red Dot scope; AR-15 Colt Model M4A1 .556/.223; AR-15 Windham Weaponry .556/.223 w/ Nc-Star 3x9x42 scope; AR-22 Smith & Wesson M&P; Remington Model 700 Sendero, SS fluted, bolt .300 win-mag w/ Nikon Monarch 5×20 scope; Remington Model 700 CDL bolt, ss fluted .30-06 w/ Nikon Monarch 4×16 BDC scope; Remington Model 7600, carbine pump .30-06 w/ Nikon Monarch 3×9 BDC scope; Remington Express 870, 28” BBL pump ribbed, 12 ga.; Remington 870 Wingmaster, slug BBL pump, 2 ¾, 12 ga.; Remington Defender 12 ga.; Winchester Model 97, 18” BBL pump, 12 ga.; Marlin Model 336A, lever action .30-30 w/ Nikon Prostaff 3×9 BDC scope; Savage Mark II, bolt w/ clip .22; J.C. Higgin Model 48DL, bolt .22; Mossberg 500 youth, pump, 20 ga.; J.C. Higgins Model 20, Sears & Roebuck pump, 12 ga.; Marlin Model 336A, lever action .30-30 w/ Nikon Prostaff 3×9 BDC scope; PA Pellet Flintlock 26” rifle, .50 cal; CVA Optima rifle, 26” Syn. .50 cal. ; Styer Model M9, semi-auto, 9 mm; AA Arms, Kimel Industries Model AP9, semi-auto, 9 mm; S&W Model 66, .357 mag, 4” SS barrel; Night vision monocular; Nikon Monarch VCC rifle scope; Champion Safe Company- Trophy gun safe heat rod 1500 degrees tested Model 5000-50M; Headlamps; Turkey calls; Elk calls; Deer call; Magellan Triton 500; Holsters; Gun locks; Benchmade 201 activator; Benchmade Tanto folding knife; 8 gun bird pecked hickory gun cabinet; Golf clubs; Golf club set; Fishing poles; Lead sled; 2 ATV helmets, medium. Shop Tools: Lincoln electric AC-225 arc welder; Welding helmets- Kobalt & Chicago Electric; Central Machinery 13” drill press; Craftsman 6” jointer planer; Craftsman router; Wagner electric painter; Paslode Impulse nailer; Black & Decker 4 pc. saw and drill set; Chicago 12” compound mitre saw w/ Craftsman stand; Craftsman 10” band saw; Chicago double cut saw; Craftsman 10” table saw; Grizzly 14” cutoff saw; 22” Grizzly scroll saw; Craftsman router w/ table; 2 hp 29 gallon upright air compressor; 5500 watt Briggs & Stratton generator; RYOBI hammer drill; Campbell Hausfield set of 4, nailers, stapler, brad guns; Portable variable speed bandsaw; Propane-oxygen torch; Porter Cable plate jointer; Craftsman wheel grinder; Black & Decker 9” angle grinder; ½” electric impact driver; Jig; Circular saws; Hand axes; Hammers, wrenches, screwdrivers; Angle grinders; Pipe clamps; Craftsman 6 gallon Shop Vac; Louisville 8’ fiberglass ladder; Werner 6’ ladder; Extension ladders; 3 shop rollers; Jackstands; Craftsman 3.5 ton service jack; Craftsman stool; Craftsman creeper; 2 new fire retardant coveralls. 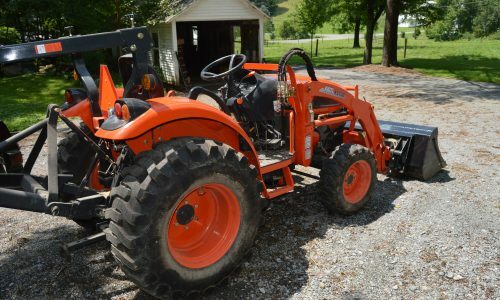 Farm: 2011 Polaris 500 EFI, 1863 miles; 2013 Kioti CK30 KL130 loader 130 hr. 4WD, quick attach; 3 pt. blade 6’; PJ trailer 6’x12’; Log rollers; Troy Bilt 27 ton log splitter; 3 pt. potato plow; pulleys; chains; John Deere Super Trac 303 tractor hydraulic fluid; ice tongs; fence stretcher; scales. Lawn & Garden: John Deere L110 42” cut riding mower, 500 hr. 2013; Craftsman LT1000 42” cut riding mower; Cub Cadet Lawn Sweep; Stihl MS250C 16” chainsaw; Husqvarna 455 Rancher 20” chainsaw; North Star Series 2272Q sprayer; Craftsman 22” weed trimmer; lawn roller 4’; 2 plastic greenhouses, 6.5’x5’x5’; Brinley Broadcaster spreader; Brinley aerator spreader; Craftsman 18” tiller; Welbilt 1 hp shallow well pump; tomato cages;hand sprayer; shovels, rakes, brooms, digging iron, forks; 8 sets of metal racking. Antiques & Household: Singer sewing machine w/stand; antique cabinet w/ porcel; wooden military box; Crosscut saw; gas masks; Blue Ball jars; egg scale; hand ice crusher; National Washboard Company No. 512 washboard; old ladles; copper tea pot; Ford, Coca-Cola, Smith & Wesson advertisement signs; pulleys; milk cans; milk can w/spout; early canners; oil lamps; #3, #5, & #6 crocks; #5 jug; cast iron skillets; 3 fireplace shovel & brush sets; General Electric refrigerator- 4 yr. old; Kenmore stainless steel electric range; Kenmore Elite stainless steel refrigerator; Frigidaire upright freezer- 6 yr. old; air conditioner; Elite 6 qt. hand crank ice cream maker; Enterprise electric meat grinder w/ electric motor; futon; dual reclining loveseat; table w/ 6 chairs; Rustic log furniture: bench, 3 rocking chairs, end table; bear bench; wine rack; Deluxe tin mop squeeze; stainless butcher table; 50” Sharp flat screen TV with no remote; 2 wooden rocking chairs; Portable Buddy propane heater; Presto pressure canner; Browning outdoor 2 burner propane range; 3 kerosene heaters; canning jars; cots; pocket knives; 2 wooden dynamite boxes; ab doer twist; 2 feed carts; wire animal cage; wooden crates; wooden flag sign; misc. household items. Auctioneers’ Notes: Pride of ownership evident by the well-kept conditions of all auction items. Something for everyone! www.auctionzip.com (see link below) for more information. 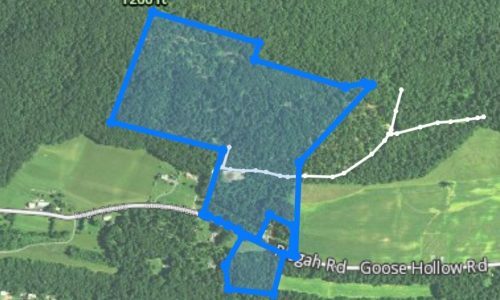 Saturday, August 25, 2018 @ 11:00 A.M.
Property Description: Beautiful 103 acre parcel of Woodland. 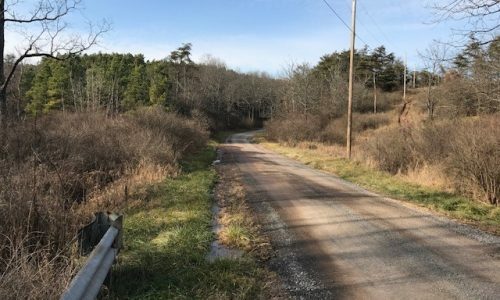 Has lots of road frontage along Doran Road for easy access. Lick Branch Creek runs through a portion of the property. The terrain is a level to sloped and has some nice potential building spots for cabin or home. Land has not been perc tested. 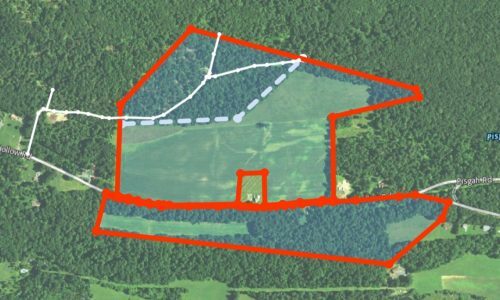 Property is currently leased for hunting, but lease will expire when new buyer purchases property. 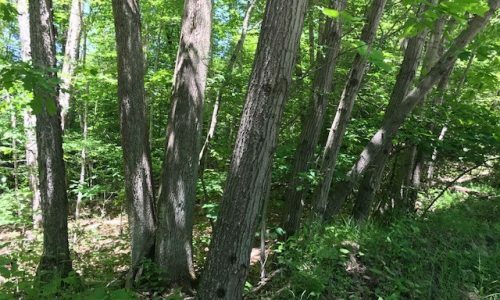 Great opportunity to purchase your own private hunting & recreation land! Only 8 miles from Pa Turnpike exit 180! Open House Date: Saturday August 4, 10:00 A.M.-12 Noon. Terms: $20,000 deposit day of auction. Transfer taxes paid by the buyer. Settlement in 45 days or before. 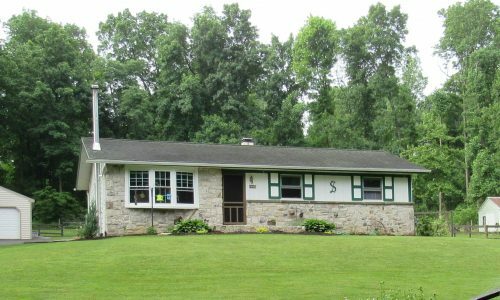 Auction Location: 495 Wert Rd Millersburg. Actual property is 00 Wert Rd. 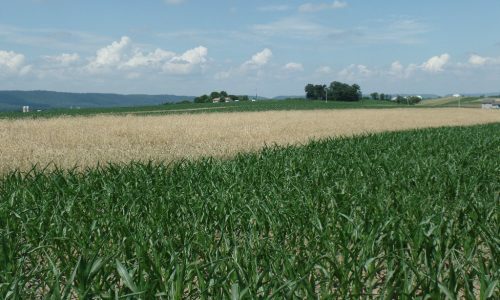 Property Description: 59+ acres of unimproved tillable farmland on Wert Road and Short Street in Millersburg. Topography level to slightly sloped, fertile soil, and crops look excellent. 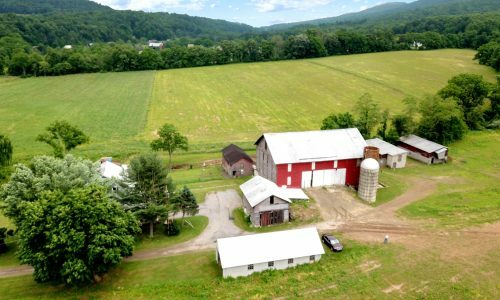 Land is in Ag Preservation Easement, however, one homestead can be built on subject property. 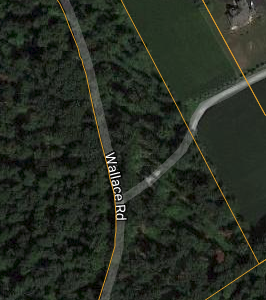 GPS reference for land: 311 Wert Rd. Millersburg, PA 17061. Open House Date/Auction Preview: Sat. August 10, 2018, 1-3 P.M. Otherwise by private appointment. Contact Glenn at 717-271-8868 to schedule an appointment. Terms: Settlement on or before October 24, 2018. $30,000.00 down payment on the day of the auction. 2% transfer tax to be paid by the buyer. Real Estate taxes to be prorated from settlement day. Tractors: Allis Chalmers CA; John Deere 530, All fuel, 1959 factory wide front end, serial # 5303110; John Deere 330, no serial # plate; John Deere, 40-S serial #68493; John Deere 50 serial #5011714, Yakima hookup with plow; John Deere 320-S, serial # 320364; John Deere M, factory rubber, painted in the 80s, serial # M-25994; John Deere 530, gas, narrow front serial # 530637; John Deere 430, power shuttle or directional reverse, no serial # plate; John Deere 730 diesel, power steering, 3-point hook up, 1190 hours, serial # 731588; John Deere 40 crawler, original tracks, low usage, neighbor bought it new, believed to be very low hours; John Deere 430, crawler, directional reverse, factory blade, serial # for blade 620990, crawler serial # 144561; John Deere MC crawler, serial# 17285; John Deere tractor G, serial # 11507. Tractor Parts: Two weights for a 330 John Deere, serial # M2729T; John Deere 50 parts; Many parts for John Deere A and B; Several sets of fenders and fuel tanks. 2-3 hr. of selling tractor parts. ****LOTS & LOTS OF PARTS! Food stand provided by local Christian school. 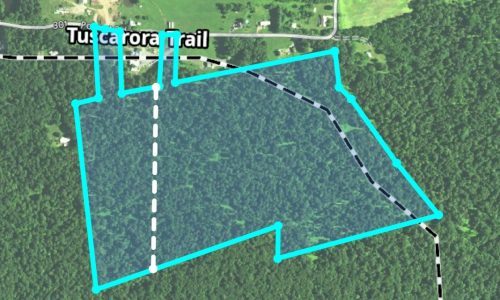 Saturday, August 18 @ : 1:30 P.M.
Saturday, August 18 @ 1:30 P.M.
Parcel #1: 41 Pole Cat Rd.- 79.53 acres (72 tillable) with 2 streams. Improvements include a remodeled farmhouse, bank barn and several outbuildings. Very desirable setting w/ mountain views. Enrolled in Ag Preservation. Apx. Annual Taxes: $2,955.85. Down Payment day of the auction: $30,000. 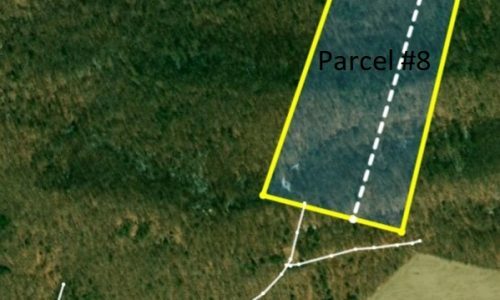 Parcel #5: Pole Cat Rd.- 84+/- acres of woodland. Great hunting. Borders a wildlife preserve. Great terrain. Apx. Annual Taxes: $99.20. Down Payment day of the auction: $20,000. 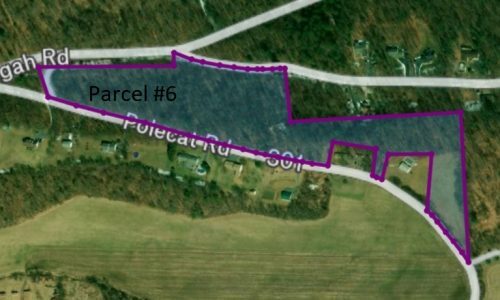 Parcel #6: Pole Cat Rd.- 10.5 acres of woodland. 2,200’ of rd. frontage. Apx. Annual Taxes: $29.45. Down Payment day of the auction: $5,000. 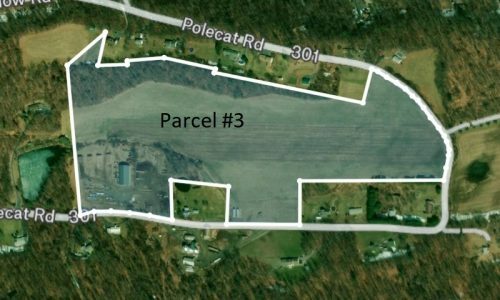 Parcel #3: Pole Cat Rd.- 53+/- acres. Improvements include a 60’x120’ pole building. 1,910’ of road frontage. Apx. Annual Taxes: $1,557.75. Down Payment day of the auction: $20,000. 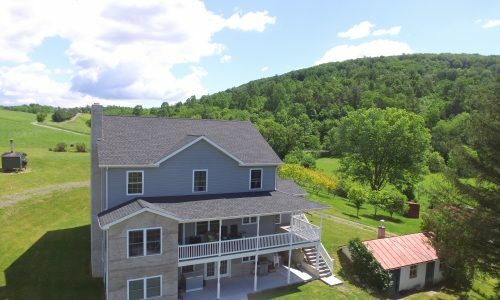 Parcel #4: 606 Pole Cat Rd.- Country house on 4.75 acres, overlooking a pond. Improvements include a pavilion, bank barn, a 40’x60’ truck shop, 2- 10,000 gal. underground fuel tanks and a grain handling system with a dumping pit, a 20,000 bushel bin, a 12,000 bushel bin and a 10,000 bushel bin. Apx. Annual Taxes: $2,325.00. Down Payment day of the auction: $15,000. 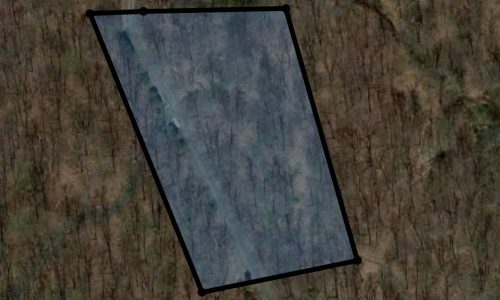 Parcel #2: Pisgah Rd.- 100+/- acres. 73.5 tillable and the remainder woodland. 5,980’ of road frontage. Apx. Annual Taxes: $370.51. Down Payment day of the auction: $30,000. Saturday, August 18 @ 9:30 A.M.
Property Description: 2012, 2-story home, daylight basement, custom kitchen, stone fireplace, and much more. Large bank barn, small stream. 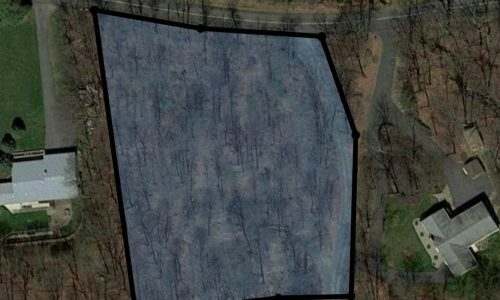 11 acres. A family friendly setting with plenty of room for your animals! Open House Dates: Tue. July 17, 2018 5-7 P.M. and Sat. July 28, 2018, 1-4 P.M. Call Meryl at 717-629-6036 for more details or a private showing. Terms: Settlement on or before October 17, 2018. $20,000.00 down payment on the day of the auction. 2% transfer tax to be paid by the buyer. Real Estate taxes to be prorated from settlement day. Toy Collections: Approx. 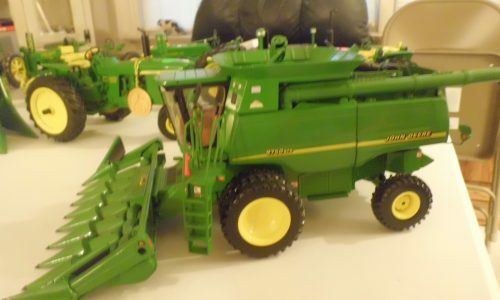 450 toy tractors, combines, skid loaders & implements featuring Ertl Gold Coin Medallion Series, Ertl Gold Key Series, Ertl Precision Series, Ertl Precision Elite Series; Ertl Prestige Collection Series, Franklin Mint, SpecCast, Bruder, Hubley, Tru Scale & others. Brands include Allis Chalmers, Black Hawk, Case, Case-International, Caterpillar, Cockshutt, Co-Op, David Brown, Deutz-Allis, Farmall, Ford, Fordson, International, John Deere, Massey Ferguson, Massey Harris, McCormick, Minneapolis-Moline, New Holland, Oliver & Steiger; Implements include forage & grain wagons, pull type combines, bale thrower & flat wagons, grinder/mixers, sq. & round balers, plows, rakes, manure spreaders, corn planters, haybines, disks, rotary mowers, elevators & more. A Few Special Mentions: Allis Chalmer All Crop Harvester 60 pull type combine (Franklin Mint Precision) high detail w/ chains & belts & canvas web; wooden Peterbuilt truck w/ double deck cattle trailer made by Sam Martin, Leola very nice; several crawler tractors with steel tracks; Numerous Precision tractors right out of show cases & super clean w/ original boxes; Also Precision tractors w/ implements attached like disks, plows, sickle bar mower & cultivators; Approx. 50 lots Tonka, Nylint & Struto construction toys including trucks, wheel loaders, graders & more; Approx. 60 Winross & other trucks including many freight companies, cattle haulers & local fire departments; BP toy trucks; 20+ coin bank trucks; lots 1/32 & 1/64 scale toys; John Deere, IH & other memorabilia, including fuel pumps, mini 5 gal. oil cans, tins, lunches, plates & more; (2) large oak glass front display cabinets w/ mirrors & lights & glass side doors; display case with lift off glass top; tractor history books & posters. ****Go to www.beiler-campbell.com or call 717-786-8000 for complete catalogue after Aug. 1. Horse Related: numerous draft & driving size halters; 30 double end snaps; bags of harness leather; gal. leather finish; Singer treadle sewing machine; blacksmith box w/ some tools; misc. water buckets & tubs; misc. trailer & carriage lights; Show Shine conditioners; Absorbine Show Sheen conditioners; sponges & brushes. Misc. : Stainless steel 5 gal. insulated beverage dispenser; Emerson 3 cu ft freezer; electric grill; french fry cutter; cash register; Duratract implant gun; wooden step ladder; (4) hog scrapers; bicycle; gas heater; white caulk. Auctioneers’ Notes: Noah Hoover & William Rhodes are selling their personal collection of toys. Also, Noah Hoover’s remaining shop equipment & tools. Starts at 9:00 AM with tools, equipment & hardware. Toys by approx. 9:30. Something for all collectors. Food Stand by Farmersville Fire Co.
Toy Catalog Available after August 1. 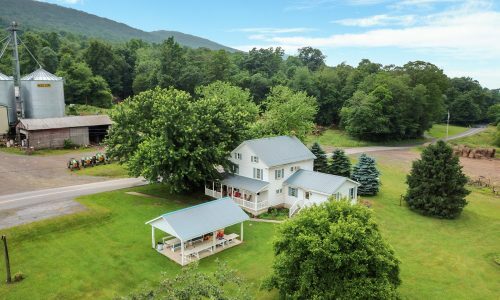 Tuesday, August 7, 2018 @ 6:00 P.M.
Property Description: This 1.5 acre property comes with a beautiful 2 bedroom, 1 bath ranch home. Move-in-ready home, newer kitchen cabinets, hardwood floors and vinyl windows. Lots of windows for natural lighting. Full basement. 26×28 Barn-garage (new siding and roof) 12×18 lean-on garage, 26×28 horse barn with Hayloft, 8 x 12 storage shed, 2 panel solar system, 25 horsepower Kawasaki propane power unit with 5 horsepower compressor, 8 cubic foot cooler with cooling compressor, water softener 1,000 gallon propane tank, 1,000 gallon air tank, paved driveway, 2 fenced pastures, large established garden, much more. Honey Brook Township, Twin Valley School District. Terms: Down payment of $25,000 required day of sale. Settlement on or before October 5, 2018. Transfer taxes to be paid by buyer. Real Estate taxes shall be prorated. Taxes: $3209 /year. Attention Realtors: 1 % Broker Participation being offered to Realtors who pre-register with their buyers and who become the successful bidder day of auction. Pre-registration forms and additional pictures are available on-line at www.auction zip.com. 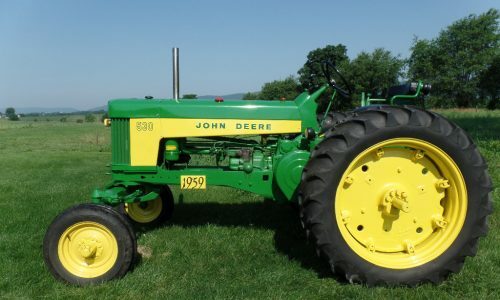 Public Auction: Tractors, Vehicles, Farm Equipment, Mowers, Tools & Misc. Friday, June 29, 2018 @ 2:00 P.M.
Auctioneer: Christ Taylor AU# 005421 (717)-371-1915 & Harold Martin AA#019488 (717) 738-4228. Vehicles: 04’ Jeep Grand Cherokee, 240K miles, leather interior, sun roof, all-wheel drive, engine knock; 95’ F250 XLT, 4WD pickup truck, 362K miles, 7.3L Power stroke Diesel, some rust. 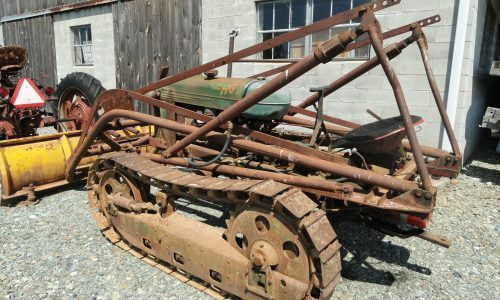 Tractors, Farm Equipment, Lawn & Garden: 1949 Oliver HG Cletrac crawler tractor w/ Ezee Flow hyd. loader & 90″ snow blade, serial # 43GA764, good straight sheet metal, not running; Farmall C tractor, narrow front, good metal, wheel weights, cultivators, 2 bottom plow, & bar mower, not running; Oliver & other grain drill; Massey Harris Clipper pull type combine w/ side bagging platform as is; 8′ disk; 3PT bale spear; Ford 3 bot. plow; Ferguson 2 bot. plow; 7′ harrow; 5′ rotary mower; Farm & Country 6′ blade; Cub Cadet 2166 lawn tractor 42″ cut 440 hours nice; JD 345 lawn tractor 54″ cut; JD 3′ x 6′ trailer w/ tailgate; Craftsman 6.5 HP mower w/ bagger; Huskee front tine tiller; Power Boss pressure washer; Craftsman 8 HP 27” snowblower like new; Husquarna 340 chain saw, like new; Stihl electric leaf blower; Agway 5 HP rear tine tiller as is; Craftsman mower as is; plastic stock tank; set old Air Boss skid loader tires; pallet forks; JD riding mower for parts; Yamaha 4 wheeler no title; Weedeater gutter cleaning kit; gas cans; hand sprayer; digging iron; post hole digger & other misc. tools. Shop Tools & Equipment & Misc. : Dayton 7000 Watt generator w/ 13HP Honda engine, like new; Freedom 3000 watt inverter/charger, new; Craftsman 10” radial arm saw on cabinet w/ drawers; 3 jointers including 8” Craftsman; Craftsman router on stand; table saw; Craftsman & Air Mate air compressors; Craftsman drill press; Craftsman shop vac; old heavy band saw; scroll saw; Craftsman stick welder; torch set on cart w/ bottles; folding metal saw horses; Traulson commercial refrigerator; new 10 gal. water heater; Elkay water cooler; 120K BTU oil furnace; 3 high bay lights; shop fan; Gibson freezer as is; SS triple sink; Brinkman smoker grill; Uniflame SS grill w/ side burner; LP Reddy Heater; small propane tank; 6 old church pews; wheelbarrow; hand cart; large bird cage; 4′ x 6′ white board; safety cones; 4 metal shelving units; 2 & 4 drawer file cabinets; 2 metal cabinets; 14′ wooden step ladder; 7 bundles snow fence; misc. wood trim; heavy chain; 220 volt & other misc. extension cords; lots of misc. hand tools. Tuesday, June 26 @ 6:00 P.M. Description: 7 acres of woodland located on the heart of Welsh Mountains, located next to open fields, lots of deer & turkey. Perked & probed, approved building lot. Ready to build your dream home. Don’t miss this rare opportunity!!! Terms: 10% down payment day of auction, settlement in 60 days. Real Estate taxes shall be prorated. Estimated taxes are $­­­­­875/year. (Current taxes are $6069/year for 48 acres.) Tax Parcel #200-25914-0-0000. *****Attention Realtors: 1% Broker Participation offered to Realtors with a buyer. Your buyers must be preregistered 72 hours prior to auction. Auctioneers Note: Pending final subdivision approval. For more information or private showing contact auctioneer Kore Fisher at 717-587-2539.